I have had this Black Mission Fig Tree for five years. It has never had any fruit and hubby was already wanting to pull the plug but I kept insisting, "It is still a young tree. Give it some time." And TA-DAAAAA.... this year it has fruit on it. Quite a bit actually for such a young tree and needless to say: It is DELICIOUS!!! We have been eating fig with goat cheese for weeks and today I am baking a cake (yes, gluten free and GAPS friendly); took me about an hour, including baking time, so totally do-able. Heat oven to 375F. Butter a 9 inch pan; I used a pyrex dish. Set aside. In mixing bow #1, mix the dry stuff: almond flour, baking soda, salt. In mixing bowl #2, whisk together the eggs, melted butter, vinegar, honey and vanilla. Add mixing bowl #1 into #2 and beat for about one minyte. Then pour batter into pan. 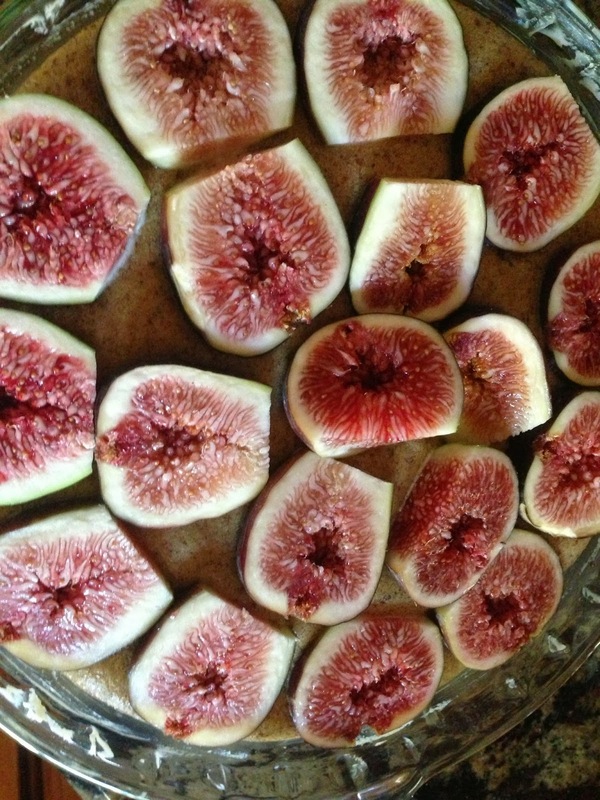 Now, remove stems from figs, cut into halves and arrange cut-side-up over the batter. Bake for 30 minutes or until done doing the center probe test. Bon appetite! I like them best with creme fraiche, of course. Sounds Dee-vine and Dee-lish! What's GAPS friendly and where do u get bourbon almond paste? I wanna make this one while figs are still in season. GAPS stands for Gut and Psychology Syndrome as coined by Dr. Natasha Campbell McBride, a cutting edge physician with her own clinic in London. More and more studies are showing that a health gutflora might be most benefitial for one's overall (mental) health. Bourbon Vanilla Paste is a thick very vanilla paste, perfect for baking of chocolate truffles.